Woman; We have a far greater problem than just a missing punch line! Poor Joel is caught in an endless remittitur loop! Man: And it's your fault, Dr. Knuth! Had Volume I appeared sooner, the remittitur designers. . .
Man: . . .would have known to include a terminating condition! Knuth: Ah, yes! The world was indeed bleak and ignorant before The Art of Computer Programming lighted the way. 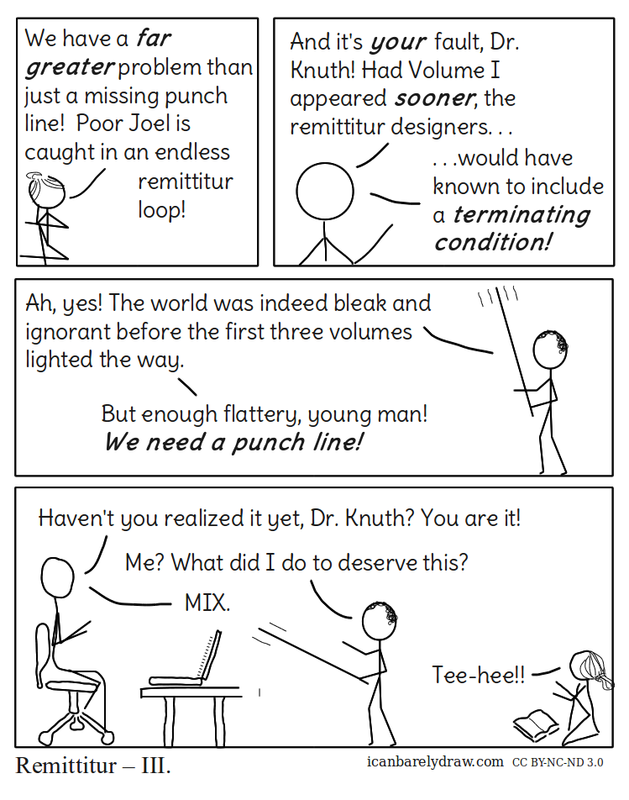 Knuth: But enough flattery, young man! We need a punch line! Man: You are it, Dr. Knuth! Knuth: Me? What did I do to deserve this?